By now a good majority of our readership is aware that this week Uncanny Inhumans #11 is to introduce a new character. That character is named Mosaic a.k.a. Morris Sackett. Marvel apparently has big plans for this character in the future with an ongoing upcoming very shortly. Uncanny Inhumans #11 is already sold out and is going to have a second print. Everyone can rest assured that Mosaic's introduction this week isn't a cameo or a soft 1st appearance. 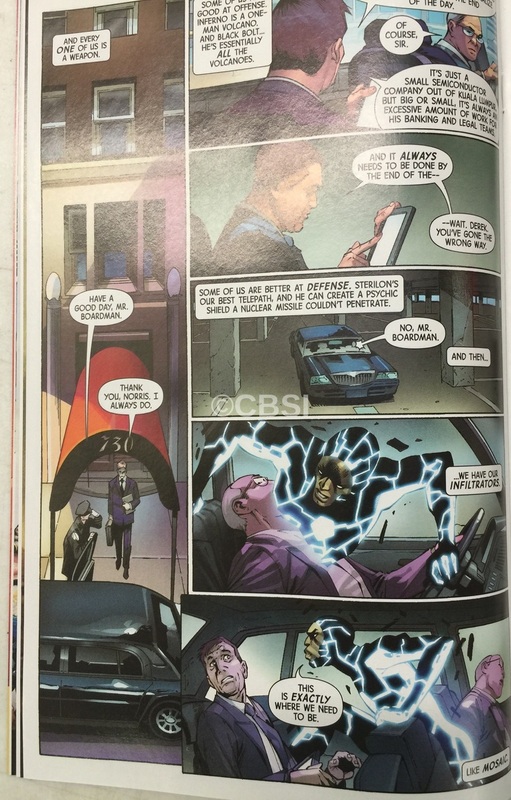 He is shown in full, uses his powers and his name is in the two panels he's featured on. If you were bullish on Uncanny Inhumans #11 you might have hit a home run. In a day and age where the Blue Marvel's 1st appearance is going for a pretty-penny, you have a chance to make some money on this book down the road. Not a huge fan of the spec, but most people who visit here frequently know I am wrong more than I am right. Happy Hunting! All the big comic shops on line are sold out, TFAW, Midtown, Dreamland, Graham Cracker. TFAW & Midtown is sold out of the regular already. I guess the better question is, where can I find spec info like this in the future? I think you just got spec info 4 days before release of the comic, if you weren’t reading this site you would not have. My question is, how was everyone aware?